To the sound of pounding toms and the blaring of dark red lighting, Thy Art Is Murder took to the stage. The first song, ‘Dear Desolation’, boasted everything a metalhead lives for. From intense double kick work from drummer Lee Stanton, to intense triplet work from guitarists Andy Marsh, Sean Delander, and bassist Kevin Butler, leading into full blown blast beats, and a blistering solo, Thy Art is Murder are the borderline between metalcore and full-blown death metal. The low screams from CJ McMahon Were rivalling that of metal giants Cannibal Corpse or metal vocal idol Phil Bozeman. Moving through their set, TAIM showcase their incredible musical ability, with intense cross rhythms and synced instrumentals despite the intricacies in the individual lines. McMahon flicking between intense guttural roars and piercing high screams, and both guitarists flawlessly complimenting each other’s abilities, with a solid backing from Butler and Stanton. The crowd, from side to side and front to back, were all moving. This was one of the most well received support slots I’ve seen, even from stadium shows with three highly anticipated bands on the bill. Before TAIM launched into ‘Reign of Darkness’, CJ “suggested” to the crowd, that it split into two halves and went to either side of the room. Everybody in the room knew what was about to happen, and what ensued was probably the biggest wall of death I’ve witnessed in person. The entire arena was involved. This led to circle pits as big as the crowd, and crowd surfing to rival most mainstream metal festivals. 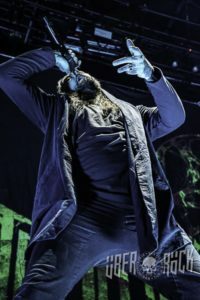 Thy Art Is Murder is certainly not a metal show to be missed. Conversely to the opening of TAIM, Killswitch Engage stormed the stage to the tune of Thin Lizzy’s classic The Boys Are Back In Town’. 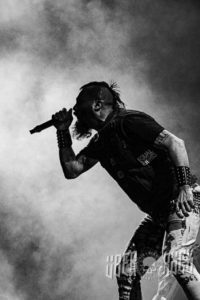 Launching from this straight into the lead single from their 2016 album, ‘Incarnate’ – ‘Strength of the Mind’; lead vocalist Jesse Leach was as confident and pitch perfect as ever, while lead guitarist Adam ‘D’ Dutkiewicz was all over the stage, acting the showman he is known to be. This pair are really a marvel to see live, and even with these two, bassist Mike D’Antonio and rhythm guitarist Joel Stroetzel still found space to prance around the stage and remain active. Drummer Justin Foley was even more intense to listen to live than he is on the albums. His driving rhythms kept the songs moving and the beat flowing. From this song, Killswitch dove straight into fan favourite ‘The End of Heartache’. All aspects of the performance were absolutely spot on. The crowd, well and truly warmed from TAIM, were getting very stuck in to Leach’s attempts to entice them into singing. From this, Killswitch flowed straight from this into more recent song, ‘Beyond the Flames’ and another fan favourite, ‘My Curse’. Their anthemic choruses, soaring leadwork and pounding rhythms make Killswitch’s music nothing short of incredible. With Leach and Adam D trading off vocals, the crowd was sinking their teeth into the material that they continued to churn out. Pouring through a solid mix of old and new material, Killswitch got to the first single the band released since the rejoining of frontman Leach; ‘In Due Time’. This led to the crowd going from an enormous circle pit to grabbing each other and screaming the chorus back at the band. Killswitch are truly an exemplary live band and know how to run a set to hold interest and keep energy rising and pouring from their fans. 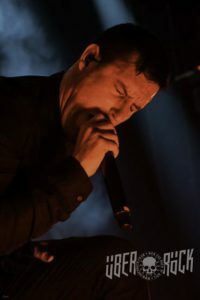 With no faults from any of the members and nothing but high energy from showman Dutkiewicz, as well as powerhouse vocals from Leach, you never want to miss an opportunity to see this band while they are at their peak. Amidst dark red lighting and loud smoke cannons, enter Parkway Drive from the back of the crowd. Theatrics have always been a massive part of Parkway’s set, and this entrance left the crowd confident that they would certainly deliver. Their opener; ‘Wishing Wells’, being the opener for their latest album ‘Reverence’, was an immediate draw for the crowd. With bright lighting, set in time with the beating drums from Ben ‘Gaz’ Gordon, and soaring tapped harmonics from Jeff Ling, Winston McCall did not struggle to get the crowds attention and get everybody involved. With pits as far as the eye could see, this concert was set to be a heavy one with high energy and no breaks. Their next song, ‘Prey’ saw McCall highlighted by a spot light and strip lighting, used cleverly to black out everything behind him. Being engulfed in a cloud of smoke, the band didn’t lose their touch. The whole crowd joining McCall in chants of ‘Prey’, and no signs of tiring in the pits. Straight after this, ‘Carrion’ really saw the whole room with arms in the air, headbanging and singing. This song really showcased how tightened Parkway’s performance is, with the guitars and cymbals in perfect sync, and stops being executed flawlessly. Overhead strobes rounding off the performance and setting the atmosphere, Parkway were well and truly underway. Amongst a myriad of harmonised guitars, intense drum fills, powerful bass stabs and demonic growls, Parkway’s set just got more and more intense, as the played through a solid selection of old and new songs. Fog engulfing the band members and lighting being used to effectively highlight individual members of the band, Parkways live show is incredibly well thought out and intricate. As an audience member, sometimes you feel like you’ve missed something that you should’ve seen, which just isn’t the case with Parkway. You know where to look. You know what you should be doing. You know you’re in good hands. Another strong point of seeing Parkway: pyro. 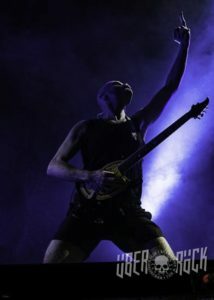 ‘The Void’ saw the whole band showered in sparks, falling from the ceiling and coating the whole stage like a curtain. The pyro continued throughout the set, with accents on snare hits in ‘Dedicated’, and throughout ‘Absolute Power’. Parkway Drive have another knack of releasing tracks heavily reliant on gang vocals. These vocals usually either sing along to the guitar line, or even just a melody used to highlight the piece. Most bands using this style of recording, would play to a backing track. Not Parkway. The crowd did it for them, from the moment the song started. Seeing every member of the crowd throw their hands in the air and start singing to ‘Wild Eyes’ was a personal highlight. Out of nowhere, Parkway continued with a complete disregard to the option of a backing track. After a complete blackout, and the vague sight of platforms being raised on stage, orchestral music was heard. The lights then came on to reveal a full string quartet on the platforms, playing through ‘Writings on the Wall’. The quartet stayed for ‘Shadow Boxing’, and the platforms were then lowered. After this, the guitarists and bassist were raised for their initial closer, ‘The Colour of Living’. The set closed, and the room was plunged into black. Chants of ‘Parkway Drive’ were being thrown, and McCall reappeared, carrying a torch. He turned, and launched it into a Pyro tower, initiating their fan favourite, ‘Crushed’, and pyro across the entire stage. From this into ‘Bottom Feeder’, the crowd left having seen a show. 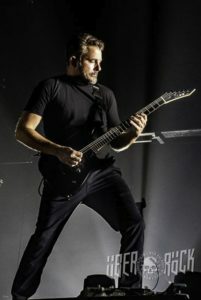 Parkway Drive are one of those bands that are an intense experience, even if the music is not something you’d listen to. Do not miss Parkway Drive. Parkway Drive headline Bloodstock on Saturday 10 August. PHOTO CREDIT: All photos © BandTogs/Über Rock. You can view our full gallery of photographs HERE.